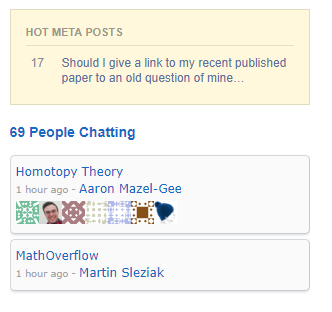 I like to hang out in the homotopy theory chatroom. I used to navigate to this and other chatrooms using a link on the main site. This seems to have disappeared. Is there a reason for this change? I would like it to stay there. Otherwise it would be hard for new users to find this feature. Since I posted my answer, the OP has clarified in a comment that the intended question was about the rooms shown in the sidebar. So what I originally posted was actually an answer to a different question. Therefore I have expanded the answer a bit to describe various ways how to access chat. However, the intended question is about navigation to chat through the user interface of the site. I am not sure how are the room displayed in the sidebar selected. But it seems that usually the rooms which recently had some activity are chosen. See also: How are the chatrooms shown in the sidebar selected? Still, I will stress that what I write in the last two bullet points is based just on my experience - I did not find any official documentation. If you are interested in more details about this, then probably the right place where to search (or ask) would be Meta Stack Exchange. Not the answer you're looking for? Browse other questions tagged discussion support user-interface chat sidebar . How to get to meta? 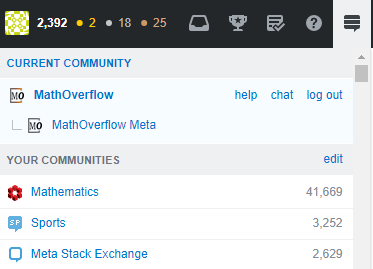 Where is the link to Meta from Mathoverflow? People without math.SE profile cannot join chat? Is it possible to keep deleted questions in my account? How can I customize site in my browser to get “old feel” look of MathOverflow?